The above title page is for a Dutch/French version of the book, printed in 1688. The added section or extension of the title (after Par M. Grotius) roughly translates to ‘Divided into 3 Books (parts), Or an explanation of the Rights of Nature, the Rights of Men, and the Principle Points of Public Rights, or those concerns of the public’s State government.” This version was translated by M. De Courtin. Known by his Latin name Hugo Grotius, Hugo de Groot of Holland played a key role in the lives of many western European leaders and politicians. He was born in Delft in 1583, on Easter Day. By the time he reached 10 years of age he was already considered a prodigy child. By the age of 12, he had commenced classes at the University of Leyden. Grotius graduated from the University at just 15 years of age (1598), and was awarded a doctorate degree for his achievements. By 1607, he was appointed to a gubernatorial position in which he served as “Advocate-Fiscal” and functioned as an equivalent to an Attorney-General, a Public Prosecutor, and a local Sheriff in Holland. During his services he managed to upset a number of individuals of upper and lower ranks, resulting in his imprisonment due to his positions regarding a controversy that had erupted between courts and the church. His first successful claim to fame came not from any wrongful imprisonment, however, but rather from the way in which he managed to escape from his prison quarters. By hiding within a sizeable trunk, he escaped without recapture, after which he made his way to France. 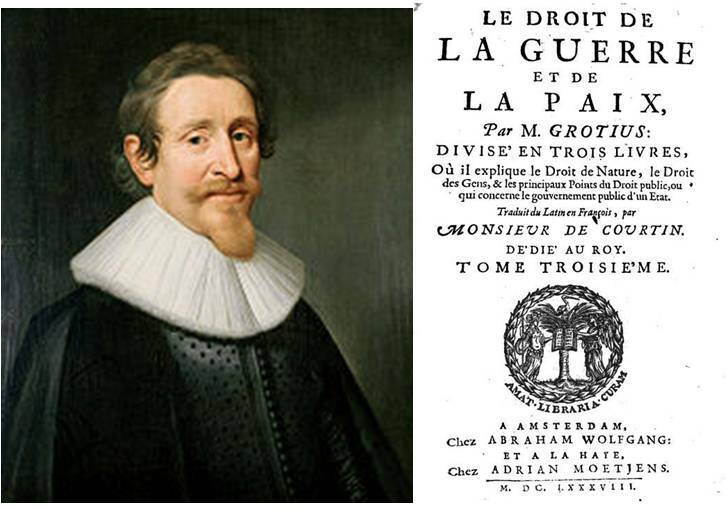 During the years that followed his establishment of residency in France, Grotius wrote a number of critical books in which he reviewed the practices of the Church, and the relationships between Divine Law, Natural Law and Civil rights. 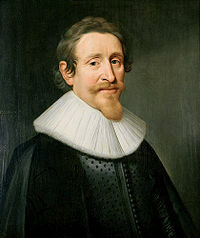 From the beginning, Grotius’ classical relationship between religion, government, philosophy and theology was constructed based on an open-minded philosophical relationship that he developed between Divine Law, Natural Law, a hybrid of these two referred to as Positive Law, and the various forms of Law produced for the purposes of Mankind. Indicative of Grotius’ religious stance personal are four of his early writings: De Satisfatione Christi (1617), The Truth of the Christian Religion (1632), De Coenae Administratione (1638), Via ad Pacen Ecclesiasticam (1642), and Votum pro Pace Ecclesiastica (1642). Grotius was devoted to the church and Divine Law, but also the Natural Law and a different set of Laws produced by Man that were for the most part compliant with the first two Laws. In The Truth of the Christian Religion, a tale is told about Dutch seamen seeking to spread the truth of the Gospel to a Turk, Jew and Pagan during their travels. With this writing he makes his intentions and personal philosophy a bit easier to comprehend. His applications of these experiences however had a much greater impact upon people as a whole. This is what made his most important writing On the Law of War and Peace a most essential reading for University programs throughout much of Great Britain. With a well-formed knowledge of the history, philosophy and politics of religion, Grotius soon became one of the first most respected writers in international law through his book On the Law of War and Peace. With this book he penned some of the first standard for international legal rights pertaining to civilians and the government of their mother country, and individuals who become forced to abide by or answer to the laws of foreign governments. One of the more important concepts reviewed in On the Law of War and Peace was jus ad bellum and jus in bellum, the notion of adhering to justice engaged in for the good of the people and society and justice of the good for the same. A number of key points Grotius referred to in these writings pertained to the practice of war, when war is engaged in for the right of people as a whole. In some cases, according to Grotius, war was respectfully warranted because of its existence as “necessary evil”, leading to the practice of war and the conduct of individual and teams participating in this war as a form of human behavior and conduct that could exist so long as it was properly managed, engaged in, and regulated in times of need. According to Grotius’s philosophy was existed because of “human nature” and its inherent instabilities that tend to act out throughout its existence. This “unstableness of human nature” prevented mankind as a whole from ever achieving the perfect sense and state of existence. It was impossible for the state of perfection to be reached regarding “unity and harmony” amongst all people and their societies and cultures. A large reason for the need for writings such as those of Grotius during the 17th and 18th century pertained to the travel, trade, commerce and ultimately governmental decisions and activities then taking place at an international level. These international events required that some form of standardization be adopted internationally in order to assure that fair play and advancements take place from all sides for similar reasons, through similar forms of support systems and required international understandings. Aside from international policy and law based on mankind-induced interventions and activities, Grotius also respected the common religious law that then existed as well across all nations. This particular legal system was of a theological origin, with the bulk of its teachings produced based on the writings of the most basic religious references such as Mose’s testament, the Christian Bible, the Torah and the Talmud. This other form of law already designed prior to mankind’s existence was termed the “Divine Law.” In Grotius’s mind, one of the major goals and barriers to mankind’s overall development as a community was the ability of all nations and people to reach this state of being, harmonizing Mankind’s various laws and legal actions with the demands set up by Divine Law (Sotirovich, 1978). Grotius’s writings were most important for his time, and due to their application to various nations, they were taught and professed at schools throughout much of Western Europe, at times becoming a necessity as well in programs offered by other countries well distanced politically and geographically from Grotius’s multinational European landscape settings. A number of authors of political science seem to have captured the limited application of Grotius’s overall work, along with the ongoing and perhaps unending applicability of some of the core features of his writings important to international trade to this day. One of the major problems with such a writing in a contemporary sense is easily deduced—written by a member of the Dutch communities, who at the time had everything to gain and everything to lose by trying to claim rights to the various international skirmishes and battles at seas then taking place, this series of laws were set up in order to assist western European practices at sea that were otherwise conceivable as being of military and financial intent, such as the right to steal a nation of foods and weaponries to ensure the survival of one’s own political and population masse. Trying to make sense of Grotius’s teachings, we have to consider the philosophies then at stake in terms of man and natural philosophy, mankind’s purpose for existence upon the earth’s settings and various environment, as a feature of God’s Will as well as a product of natural powers and an individual’s independent will. The naturalists’ take on Grotius’s teachings is very much an ancient philosophy, heavily promoted during the Dark and Middle Ages when it was even used to argue for the occasional murders of the masses that ensued during this time. A more refined version of this philosophy developed as scholar became more in tune with the natural environments unchanged by man and the relationship of these attributes to the natural laws they had defined. These natural laws are related to, although not exactly the same as “Divine Law.” Divine Law included man as a part of its basic fabric. Natural Law could be portrayed as a fabric representative of existence, minus any additions or changes in its perfect patterns brought on by adding mankind to the final “tapestry”. Another philosopher that the readers of Grotius would be drawn to during this time was Pufendorf, who, as evidence has already demonstrated to us, was a primary writer covered by most University education programs. Pufendorf and others claimed that international obligations, necessities, laws, and outcomes, were all producible based on the “higher nature” of Divine Law. This notion is why many natural philosophy (scientific) topics are more a part of some traditional philosophy training class, than they are a singular element used to produce a single class of its own title and nature based solely on science. As a consequence of this philosophy, a duality formed within this profession, resulting in individuals who were very events driven. These “positivists’, as historians have termed them, differed from the followers of “higher law” by placing an emphasis on the person-to-person, individual-to-peoples natures of events involving human interactions. Some philosophers interpreted these laws as serving only a government, population or “peoples” purpose which had to be generalized. Whatever the case, this seemingly deist or agnostic (atheistic?) spin on the philosophy was by no means supportive of the overall teachings of Grotius and others. Such a take on Grotius’s philosophy helped to advance the teachings of Grotius and his opponents for decades to follow, actions which ultimately led to the formation of a middle of the road convention in these beliefs, in which followers believed that both “Natural Law” and “Divine Law” could exist together, with the effects of the doctrines or laws set forth by people intermingling with God’s Law. This hybridization resulted in what was termed “positive law”, neither a pure confirmation of, or opposition to, the “higher law” professed by followers of Divinity. Since Man was inevitably fallible, as these philosophers claimed, so too could the law be accepted as performable, but in need of careful control, monitoring, management, inspection and retrospection from time to time. It had to be periodically reviewed in order to prevent events of human error from creeping in, allowing Man’s imperfections to take over (i.e. see Emeric de Vattell’s Law of the Nations, 1758). By 1750, this became the end product of both forms of law preached in the academic system. From this point on, man-made laws would always be in need of change, natural laws would not, they would only need to be discovered and for those already discovered, better understood. Whereas Cadwallader Colden’s initial training in the classics included the writing of Stoic philosophers like Cicero, he would have quickly come to appreciate the writings of more contemporary scholars like Grotius and Pufendorf. He had to be flexible with his intellectual pursuits in order to fully appreciate the teachings of both the writers and professors of Natural Law as well as those of the Divine Law in Edinburgh University. Helping him through this dichotomous training were several less controversial topics such as geography, astronomy, and mathematics, although even these were about to undergo significant change as well. Assisting him through the various controversies such program naturally bring up would be his classes in logic. These helped set the stage for the types of discussions that would follow a few years down the road in the discussions of metaphysics used to close up the program. One of the basic reasons individuals attended schools at this time, aside from theology and religion, was the learn medicine or law. Both were highly respectable professions to become involved in, with the latter (Law and Government) making up much more of Colden’s life than the former (Medicine) which he obtained additional teaching in. In terms of Grotius’ teachings, the environment associated with popular or Positive law is not the same as the natural environment associated with establishing Natural Law. Nor is an understanding of the human environment setting important to achieving a full understanding of Grotius’ teachings of jus ad bellum and jus in bellum indicative of the underlying requirements for Pufendorf’s Natural Law conditions to exist and be understood, or for the religious teachings of Moral Philosophy to be appropriately managed throughout life. Yet, each of these skills is something that Colden walked away with upon completing his program at Edinburgh. Colden graduated with the ability to define the norms of God and the norms of people, and describe in detail to future students the two different paths that must be followed to learn each of these things. Divine laws in that they are created directly by God must also be eternal. For these laws to work, Grotius states they must proceed from God, and then be approved and accepted by mankind and the individuals, and finally be allowed to be practiced by the “state” or government (the population). R.W. Lee. Hugo Grotius (London: Oxford University, 1930. William Vasilio Sotirovich, Grotius’ Universe: Divine Law and a Quest for Harmony (New York: Vantage, 1978. Hedley Bull, “The Importance of Grotius in the Study of International Relations,” in Bull, et al., Hugo Grotius and International Relations. Charles S. Edwards. Hugo Grotius: The Miracle of Holland. (Chicago: Nelson-Hall, 1981), p. 37. Thomas Aquinas. Summa Theologioe (Westminster MD: Christian Classics, 1989 ), p. 281. Hedley Bull. The Anarchical Society: A Study of Order in World Politics (London: Columbia University, 1977). Christian J. Gellinek, “Hugo Grotius: 1583-1983 and Beyond,” in Maastricht Hugo Grotius Colloquim. Forest L. Grieves, Conflict and Order: An Introduction to International Relations (Boston: Houghton Mifflin, 1977). Arthur L. Harding, “The Ghost of Herbert Spencer: A Darwinian Concept of Law,” in Harding, ed. Origins of the Natural Law Tradition (Port Washington NY: Kennikat, 1954). Greg L. Bahnsen, By This Standard: The Authority of God’s Law Today (Tyler TX: Institute for Christian Economics, 1991). Claim: ‘Theonomists’ preach and promote biblical law’s authority and wisdom, praying that citizens will be persuaded willingly to adopt God’s standards as the law of the land.’ p. 322. Onuma Yasuaki, “Conclusion: Law Dancing to the Accompaniment of Love and Calculation,” in Onuma Yasuaki, ed., A Normative Approach to War. Isodore of Seville, 7th Century. His writings equate natural law with revealed or divine law according to the church’s philosophy. Thomas Aquinas, in Summa Theologioe (1274), initiated the debate regarding whether or not there was a source of norms to be used to define the laws governing relations between nations separate from God’s law. This requires a sense of good and evil, with evil accepted as a law of nature bestowed upon people by the Creator. The “Light” of reason in turn becomes a true sense of knowing “right” from “wrong”, and is a product of “God’s light upon us” resulting in the appropriate use of mankind’s skills and sense of thought and reason. (Summa Theologioe, , p. 281. Suarez’s “Divine law” (def): “that which was directly promulgated by God”; “Positive Divine Law”: an form of natural law discernible to men through natural reason, with principles that are unchangeable. “Human positive law” validated and confirmed “solely” through actions, customs, behaviors and changes taken on by conforming nations. This ideology was later taken on by Grotius. Most scholars place the writers of Colden’s time into three schools of thought, with Grotius serving as some sort of straggler of the three. Pufendorf is considered a naturalist, Bynkershoek a theologian following the positivist tradition, and Vattel an eclectic. In terms of the contemporary philosophy, Colden was trained specifically in the writings and teachings of Pufendorf and Grotius. But he had exposure to the writings of such new age non-conformists as Isaac Newton, whose writings satisfied both the devoted theologian and the deist (“pagan”). His mathematics had philosophical as well as scientific application and meaning. Based on Colden’s later activities, he was very much devoted to the natural philosophy (science) underlying much of what he had learned. The order of the universe he most likely took as a symbol of perfection, the sign that some sort of Natural Law prevails, along with some sort of Divine Law, neither of which fully control mankind and mankind’s social will (something akin to individual free will). Colden’s interest in law and the government is a natural application of his readings in stoicist Cicero following by Naturalist Pufendorf and eclectic Grotius. His rendering of the History of the Five Nations is very much Cicero-based, only with a more modern version of this based upon “Grotian” philosophy. Colden’s fascination with the vital spirits of the body (his studies and writings on the body’s energy, its reaction to electricity, and its movement through muscles) all suggest a more “modern” metaphysical approach to interpreting the life processes, including health and recovery, than a classic materialistic, mechanistic approach. All of these are the result of the enlightenment and reformation medical science would ultimately go through throughout his life span. As a physician, engineer and as a politician his writings demonstrate the importance of Grotius’ teachings and philosophy to both his early and later professional stages in life. The following is a portion of the Table of Contents for De Jure Belli ac Pacis, or On the Law of War and Peace, by Hugo Grotius (Translated by A. C. Campbell, London, 1814). CHAPTER 1: On War and Right. CHAPTER 2: Inquiry Into the Lawfulness of War. CHAPTER 3: The Divison of War Into Public and Private and the Nature of Sovereign Power. CHAPTER 1: Defense of Person and Property. CHAPTER 2: The General Rights of Things. CHAPTER 3: On Moveable Property. CHAPTER 4: Title to Desert Lands by Occupancy, Possession, and Prescription. CHAPTER 9: In What Cases Jurisdiction and Property Cease. CHAPTER 10: The Obligation Arising From Property. CHAPTER 15: On Treaties and on Engagements Made by Delegates Exceeding their Power. CHAPTER 17: On Damages Occasioned by Injury and the Obligation to Repair Them. CHAPTER 18: On the Right of Embassies. CHAPTER 21: On the Communication of Punishment. CHAPTER 22: On the Unjust Causes of War. CHAPTER 24: Precautions Against Rashly Engaging in War, Even Upon Just Grounds. CHAPTER 25: The Causes of Undertaking War for Others. CHAPTER 1: What is Lawful in War. CHAPTER 2: In What Manner the Law of Nations Renders the Property of Subjects Answerable for the Debts of Sovereigns. The Nature of Reprisals. CHAPTER 3: On Just or Solemn War According to the Law of Nations on Declarations of War. CHAPTER 4: On the Right of Killing an Enemy in Lawful War, and Committing Other Acts of Hostility. CHAPTER 5: On the Right to Lay Waste an Enemy’s Country, and Carry off his Effects. CHAPTER 6: On the Acquisition of Territory and Property by Right of Conquest. CHAPTER 7: On the Right Over Prisoners of War. CHAPTER 8: On Empire Over the Conquered. CHAPTER 9: Of the Right of Postliminium. CHAPTER 12: On Moderation in Despoiling an Enemy’s Country. CHAPTER 13: On Moderation in Making Captures in War. CHAPTER 15: On Moderation in Acquiring Dominion. CHAPTER 16: On Moderation with Respect to Things Excluded From the Right of Postliminium by the Law of Nations. CHAPTER 17: Respecting Those Who are Neutral in War. CHAPTER 19: On Good Faith Between Enemies. CHAPTER 20: On the Public Faith, by Which War is Concluded; Comprising Treaties of Peace, and the Nature of Arbitration, Surrender Hostages, Pledges. CHAPTER 21: On Faith During the Continuance of War, on Truces, Safe-Conducts, and the Redemption of Prisoners. CHAPTER 22: On the Faith on Those Invested With Subordinate Powers in War. CHAPTER 24: On Tacit Faith.